Juicing is a healthy and easy way to get nutrients from fruits and vegetables. It has become hugely popular in recent years and more and more people are adopting the lifestyle. To get the most out of juicing, you’ll need a good juicer. Centrifugal juicers are your best bet if you’re looking for a good price to performance ratio. So, how do you choose the right one? You should take the size, power, ease of use and maintenance, noise levels, and price into consideration. 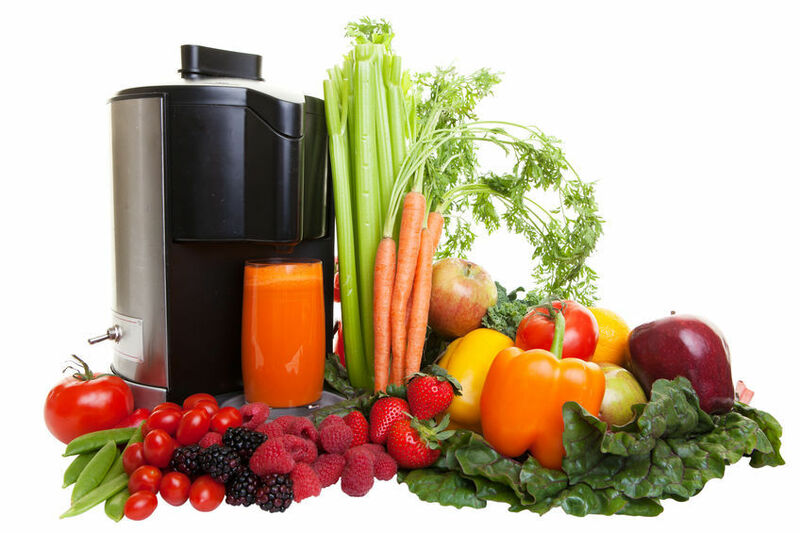 Let’s take a look at some of the best centrifugal juicers out there. The Breville JE98XL Juice Fountain Plus 850-Watt Juice Extractor is a medium-sized centrifugal juicer. It has a sizable pulp container, wide food chute, and a two-speed motor. If you’re looking for a juicer that doesn’t take up too much space on the counter but still offers serious power, this might be the model for you. The motor on this Breville JE98XL Juice Extractor delivers 850W of power, which is halfway between the Breville Compact BJE200XL at 700W and Breville Juice Fountain Elite 800JEXL at 1,000W. It is a two-speed motor. The low setting intended for softer fruits and veggies works at 6,500 rpm, while the high setting spins the motor at a respectable 12,000 rpm. This juicer has a separate pulp collector with a generous 2.6L capacity. The collector is easily removable and a breeze to clean. Like the rest of the juicer, it is made of durable polymer plastic. After you’re done with preparing your morning juice or smoothie, you can put the collector in the dishwasher together with the rest of the plastic parts. The included pitcher has a 1L or 30-oz. capacity and is made of the same plastic polymer material as the rest of the juicer. It features a froth separator, a handy addition for those who don’t like bubbles in their smoothies. A cleaning brush and filter basket are also included. The housing is made of plastic. It has an extra-wide food chute that measures 3” in diameter. That means you’ll be able to put peeled oranges and apples in it, as well as other large fruits and veggies. The Breville JE98XL Juice Fountain Plus 850-Watt Juice Extractor has a powerful 850W motor. On the lower setting, this juicer is great for soft veggies and fruits, while the higher setting is great for apples, carrots, and beets. The wide food chute makes the whole juice preparation process faster and easier. The heavy duty metal parts round off this excellent juicer. The major drawback to this juicer is that the 1L pitcher might be too small for making large quantities of juice at a time. 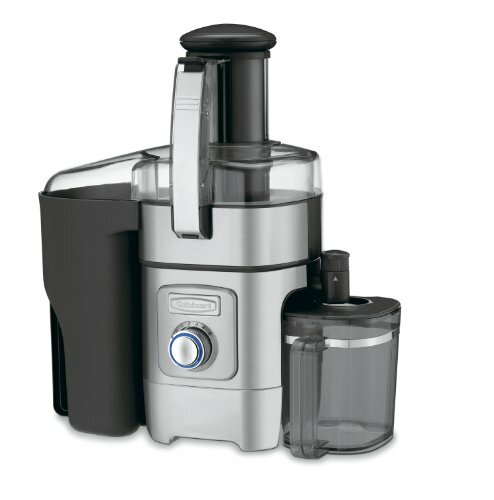 The Breville 800JEXL Juice Fountain Elite 1000-Watt Juice Extractor is a 1,000-watt juicer. It is the flagship model in Breville’s line of centrifugal juicers. It has a 2-speed motor, metal housing, large pulp container, and advanced safety features. 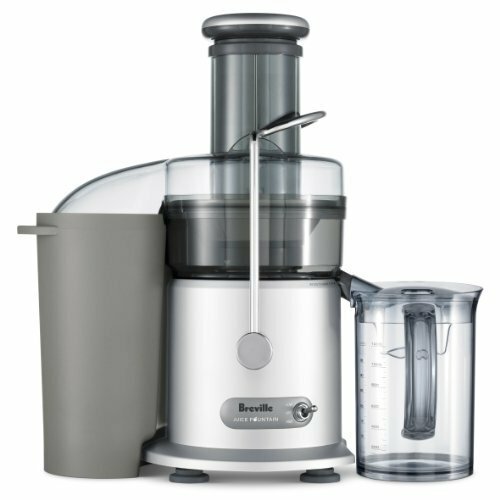 If you’re in for a sturdy, well-made centrifugal juicer, make sure to check out this mighty Breville. The Breville 800JEXL Juice Fountain Elite has a strong motor that you can use in two settings. On the low setting, the motor spins at 6,500 rpm. This mode is great for extracting juice from softer fruits and vegetables. On the other hand, the motor spins at 13,000 rpm on the high setting which is meant for hard stuff such as carrots and apples. This juicer has a large pulp container. It is made of high-quality, BPA-free polymer plastic and has the capacity of 3 liters or 3.2 quarts. The container is easy to remove and clean, keeping the overall maintenance requirements to a minimum. It is also dishwasher friendly. 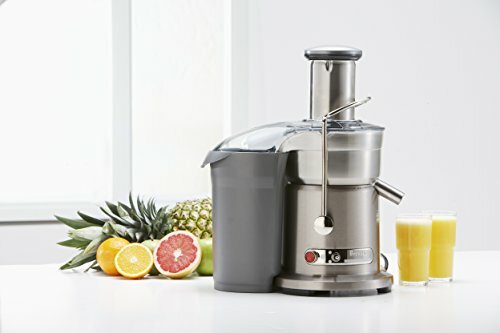 The motor on this mighty juicer is combined with titanium-reinforced cutting disc and an Italian mesh filter with 40,000 pores for exceptionally fast and smooth fruit and veggie juices. Like the housing, the filter and the disc can’t be washed in a dishwasher. The housing is made of die-cast metal and is exceptionally sturdy. The food chute on its top measures 3” in diameter and can take big chunks of fruits and veggies without a problem. Along with the on/off button, this juicer also features overload protection that prevents it from overheating. The safety locking arm doesn’t allow the juicer to start if the cover isn’t in place. The 800JEXL is a powerful and fast juicer. It has a wide food chute that allows you to process larger pieces of fruit. 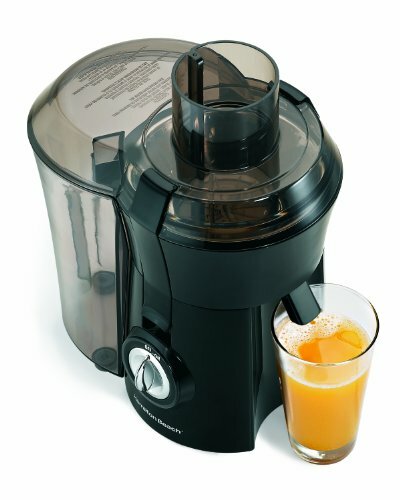 The juicer has a die-cast metal housing, titanium-reinforced cutting disc, and 2-speed motor. It also features BPA-free plastic parts and advanced safety features. On the downside, this juicer is a bit on the noisy side. Some centrifugal juicers have problems stopping heat from the motor compartment warming up the smoothies and juices, especially at high rpm. However, the Breville BJE430SIL The Juice Fountain Cold sports the modern cold extraction system. If having a cool and more nutrient-rich juice in the morning is paramount, make sure to check out this juicer. The Breville BJE430SIL is a cold extraction centrifugal juicer. 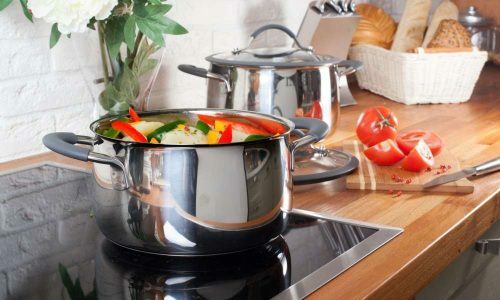 It sports the innovative cold spin technology that prevents the heat from reaching the fruits and vegetables and damaging the content of minerals and vitamins. The heat transfer is lower than 1.8° Fahrenheit. This juicer has a 2-speed motor. On the low setting, it spins at 6,500 rpm, while on the high setting it boasts a pretty impressive 13,000 revolutions per minute. Aside from the power and the speed, the motor on this juicer is pretty quiet for a centrifugal juicer. Similar to the rest of the Juice Fountain series, the BJE430SIL has a stainless steel cutting disc. It is paired with an Italian-made mesh filter. The safety locking arm prevents the juicer from starting before you put the safety lid on. The pulp basket is, like the housing and the juice pitcher, made of BPA-free plastic. It has a capacity of 3.4 liters and is easily removable. Moreover, it is easy to clean and it’s dishwasher-friendly. The juice pitcher has a capacity of 1 liter and sports a handy froth separator. The Breville BJE430SIL produces virtually no heat while it works. It has a big pulp container and a wide 3” food chute. The cutting disc is made of stainless steel and paired with a high-quality mesh filter. The motor has two speeds and it is pretty quiet. Finally, it is dishwasher-friendly. The only downside to this juicer is that it could be a bit sturdier. The Cuisinart CJE-1000 is a 1,000-watt centrifugal juicer. It has a metal housing and plastic removable parts. It also has a multi-speed motor that you can easily adjust to various types of fruits and vegetables. If you want a powerful juicer at a reasonable price, you should check out this model. The Cuisinart CJE-1000 is built around a powerful 1,000-watt motor. It has five speed settings which you can change depending on the ingredients you’re using. For leafy greens and soft veggies, you should use the slowest two settings, while pineapples and beets should be processed at the highest settings. This juicer also features a handy control knob with a blue LED light indicator. You can rotate it to select the desired speed. The juicer doesn’t start working until you press it. You can turn it off with another press of the button. The body of the juicer is made of a die-cast metal base and a plastic lid. The lid also contains the 3” food chute. You can easily detach the cover when you want to clean the juicer. It is dishwasher-friendly and easy to install back after cleaning. The juicer has a large and removable pulp container. It is made of the same plastic as the juicer cover and has the capacity of 2 liters. You can wash it in the dishwasher, together with other removable parts of this juicer. The pitcher is a 1-liter plastic container. The Cuisinart CJE-1000 Die-Cast Juice Extractor features a 5-speed motor, a large pulp container, and a die-cast housing. It is easy to disassemble and clean, with plastic components being dishwasher friendly. It is easy to use and operate, and pretty fast. On the flipside, the CJE-1000 is somewhat noisy. The Hamilton Beach 67601A Big Mouth Juice Extractor is a super-affordable centrifugal juicer. It features a modern, compact design, BPA-free plastics, and a powerful motor. If you’re looking to take your first steps into the juicing lifestyle, this inexpensive juicer might be your best bet. The 67601A is a centrifugal juicer with a potent 800-watt motor. 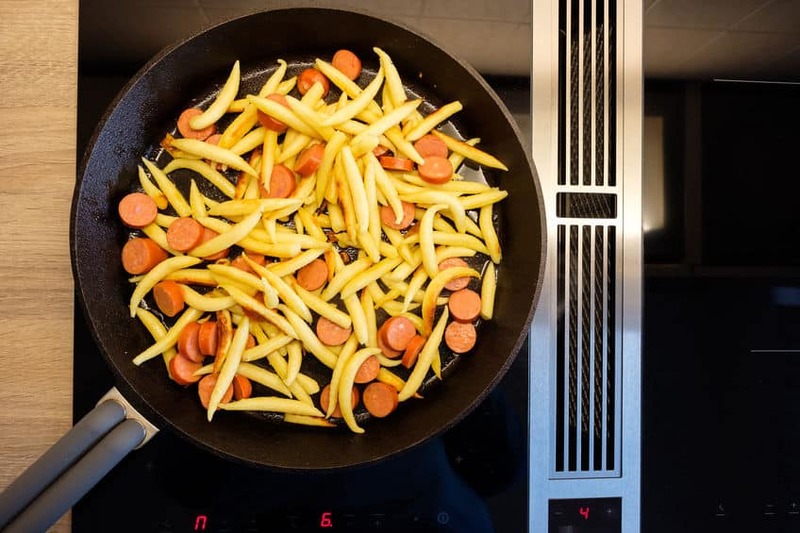 It is paired with a durable stainless steel cutter. As opposed to many other costlier models, this compact juicer has only one speed setting. For what it lacks in adjustability, this juicer makes up in low heat transfer. The housing sports a modern design and is made of BPA-free plastics. It is sturdy but lightweight and the accessories are a breeze to attach and remove. The top cover doubles as a food chute. It is around 3” wide and you can food it even whole fruits. This juicer has a large pulp bin in the back. 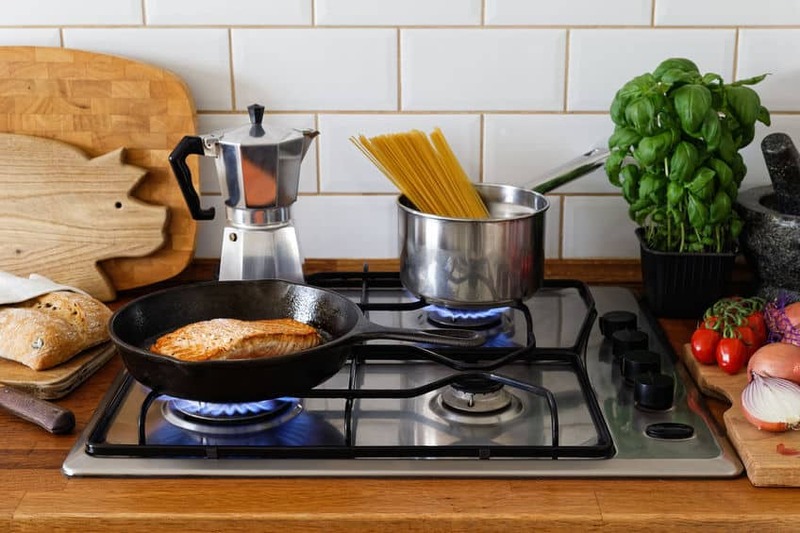 It is made of the same material as the housing and is dishwasher-friendly. It is easy to attach and remove, as well. There’s no juice pitcher in the front. Instead, you will have to use your glasses or pitchers with the 67601A. The spout is positioned high and is easily adjustable. The package also includes a cleaning brush and a recipe brochure. The Hamilton Beach 67601A Big Mouth Juice Extractor is an inexpensive juicer, perfect for beginners. It features a big pulp bin, adjustable juice spout, and wide food chute. Also, it has a powerful motor for the money and stainless steel cutter. Probably the biggest downside of this juicer is the fact that it lacks a juice pitcher. When trying to select the right centrifugal juicer, there are several important things to consider. First, you should consider the juicer’s size and the sizes of its main components – chute, juice pitcher, and pulp container. Centrifugal juicers tend to be noisier than masticating juicers and you should consider the motor noise before making the final decision. Ease of use and power are also important. Finally, you should take the price of each juicer on your short list into consideration. Let’s see what separates the best centrifugal juicers from the rest. The size of the juicer should play an important role, especially if you have a small kitchen and a crowded kitchen counter. Aside from that, the size of the juicer should depend on your needs. If you’re going to make small quantities of juice once or twice a day, a small juicer might fit the bill. However, if you have a large family and need a lot of juice, a bigger model might be in order. The size of the food chute is important, as well. If you opt for a model with a narrow chute, you’ll have to cut up all but the smallest ingredients that you intend to put into the mix. However, many models have 3” wide chutes that can take whole apples and similarly sized fruits. If you intend to make juice in large quantities and don’t want to stop every couple of minutes to empty the pulp container, you should consider a model with a big container. Many models, even those in the budget and intermediate classes, have 2-3L pulp bins. Finally, you should also consider the size of the juice pitcher, if one is included in the package. Commonly, the pitchers are 750ml to 1L and up. Some big juicers have even bigger pitchers. Here, you should base your choice on the quantities of juice you need. If you’re only making juice for yourself, a small pitcher might be fine. However, if you’re making juice for the entire family, go with a bigger pitcher. Centrifugal juicers are among the loudest kitchen appliances. That’s due to their high-rpm motors. Generally, the faster the motor spins, the louder it gets. Likewise, more powerful motors r tend to produce more decibels. If you want to make the juice early in the morning as the rest of the family sleeps, you should go with a quieter model. On the downside, you might have to sacrifice some power and you might have to settle for a smaller pitcher and pulp container. On the other hand, if the noise is not a problem and you need plenty of power, go for a big juicer with a powerful motor. A good centrifugal juicer should be easy to use. There are several things to consider here. A juicer should be simple to operate, simple to assemble and disassemble, and easy to clean and maintain. Simple operation means that you can juice fruits and veggies without having to read complex user manuals. Controls should be intuitive, simple, and conveniently positioned. Simple assembly means that all the moving parts, including the containers and pitcher, can be attached and removed within seconds. The top cover with the food chute should be detachable at the press of a button. Easy cleaning and maintenance mean that you should be able to reach all the moving parts with no hassle. Moving plastic parts should be dishwasher-friendly. Also, you might value the inclusion of a cleaning brush. The power of the juicer is another important aspect to consider before making the final decision. Generally, you’ll need at least 400 watts to juice tough ingredients. The vast majority of today’s models check this box. In fact, popular centrifugal juicers sit in the 700-1,000-watt range. There are more powerful models of course. When considering the power of the motor, there are a couple of things to keep in mind. 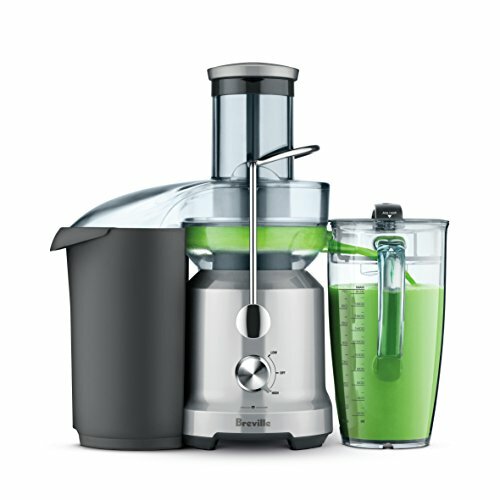 More powerful models tend to make more noise, especially on cheaper juicers. A powerful and silent juicer might cost you a couple of extra bucks. On the other hand, juicers with stronger motors give you more options. They are simply better at juicing hard and pulpy ingredients. Many juicers have adjustable speed. Usually, they will have two rpm settings which you can adjust depending on the ingredients. Some models might have more speed settings. Finally, you should consider the price of the juicer before making your final decision. Centrifugal juicers start well below the $100 mark and can go up to over $300. The decision here should depend on your needs. If you’re serious about juicing and intend to use your juicer a lot, then you might want to opt for a more expensive juicer that’s made of high-quality components and comes with all the bells and whistles. On the other hand, if you want to see whether juicing is the right thing for you, an affordable juicer might be your best bet. Also, bigger juicers with more power and juicing capacity tend to have higher price tags. A centrifugal juicer is a juicer with a rotational motor. The motor spins the cutter disc that cuts the food fed through the chute. Below the cutting disc is a metal mesh filter. After the filter, the juice flows into the pitcher. The pulp would get routed to the pulp container. Centrifugal juicers use high rpm to cut and juice the fruit and veggies quickly and efficiently. Many currently available models take only seconds to juice an apple or a beetroot. They are way faster than masticating juicers. The main things to consider when choosing a centrifugal juicer are the size of the juicer, food chute width, pitcher size, and pulp container size. You should also consider the power of the motor, the quality of the blade, and the number of speed settings into account. Finally, you may want to consider the noise, how easy it is to clean and maintain, the price tag. Before cleaning, make sure the juicer is turned off and the power cord is unplugged. Next, remove all the removable parts including the lid with the food chute. Use the cleaning brush that came with the juicer to scrub the moving parts while you rinse them in the kitchen sink. After that, you should put the removable plastic parts in the dishwasher. Many centrifugal juicers have plastic parts that can be washed on the top shelf of the dishwasher. Thanks to their high-rev motors, centrifugal juicers are particularly great at harder ingredients, such as pineapples, carrots, beetroots, and apples. However, at slower speeds, centrifugal juicers can also work with softer ingredients such as melons, cantaloupes, and tomatoes. While not as efficient as masticating juicers, centrifugal juicers can also work with leafy greens at lower rpms. However, you can’t use your centrifugal juicer for baby food, butter, fruit sorbets, sauces, and pates – things which masticating juicers can handle. 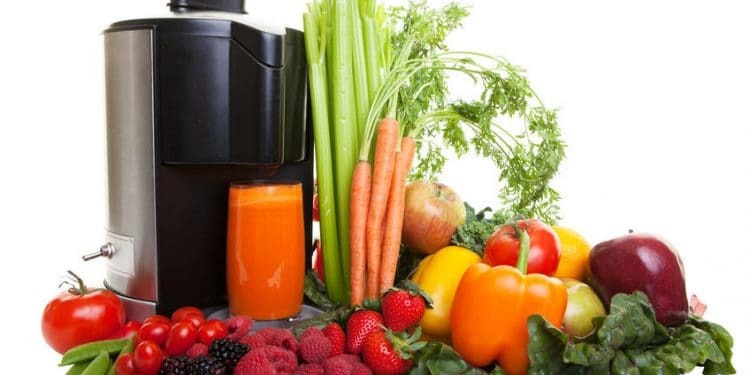 Juicing is very popular across the country because it has numerous health benefits. Here are some of the biggest. It’s time to pronounce the winner of the best centrifugal juicers comparison. The title goes to the Breville 800JEXL Juice Fountain Elite. This fantastic juicer has a die-cast steel housing, two-speed motor, titanium-reinforced cutting disc, and extra-large pulp container. It also has advanced safety features, such as locking arm bolts and overload protection that turns the juicer off when it’s close to overheating. Meanwhile, the Breville BJE430SIL is for those interested in cold juicing. It offers smooth operation, Breville’s Cold Spin technology, sturdy plastic housing, and a two-speed motor. Finally, beginners and those on a tight budget might find the Hamilton Beach 67601A Big Mouth Juice Extractor most attractive. It is super affordable, compact, and easy to use and clean.